The new Prince album was given away for free with english newspaper The Daily Mirror on Saturday 2010-07-10. The same distribution strategy was being used with the 2007 release Planet Earth. 20TEN will later be released with other european newspapers and maybe it will also have a commercial (cd) release. The new Prince album is a popalbum and it is actually some of his best output for a very long time. It is easy to like and it's been on repeat for almost 24 hours now and I still like it a lot. I think there is a good chance that it will also appeal to casual Prince listeners and I'm quite sure that most die-hard fans will love it. It has a lot of the eighties Prince MPLS vibe to it, but it doesn't sound outdated at all. 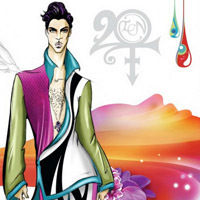 Prince's recent 3cd release from 2009 also featured a pop album MPLSound. This new one is however much more consistent and enjoyable from first track Compassion to last track Laydown. There is a majority of faster pop tracks but also a few ballads. It is fresh and it is catchy and it is funky and it has close to no weak tracks, a problem many of his recent releases have suffered from. I may be a bit biased as I am both a die-hard fan and still flying high on the fantastic gig Prince played at this years Roskilde Festival. But my best advice would be to go and get this album one way or another, there is a great chance that you will like it a lot. Buy a cd from Daily Mirror! From the heart of Minnesota here come the Purple Yoda!